And then there was one . . . woman left. When the UK's Sarah Bliley went out around midnight on Day 4, Tiffany Williamson, a Columbia, SC-born attorney now living and working in London, was the sole remaining woman left in the field. And she was sitting with about $2 million in chips in front of her. Her story is the kind that has catapulted the WSOP into mainstream consciousness as people around the world dream of getting into the main event on the cheap. For Williamson it was first winning a freeroll at Gutshot.com's live club in London (she did "top-up for a tenner" as they would say which is an add-on for about 20 bucks). That win got her in another satellite and eventually a package to Las Vegas complete with travel accomodations. Once here, she continued her roll by winning a seat in one of the main event satellites just days before the start on July 7. 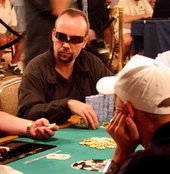 Since the main event got underway, Williamson has played a tight-aggressive game modeled after her favorite poker player Dan Harrington, and she has gone on to outlast the Action Man, as well as more than 5,500 players, to guarantee herself no less than $235,390 in earnings and even more importantly, a shot at becoming the first woman and Briton to win the main event. She is now seated at the ESPN feature table with both Raymer and Tim Phan to her left. In front of her, about 1.3 million. From across the Irish Sea, and here in Vegas, just a few tables aways, is Dubliner Andy Black who was needing some Irish luck yesterday when he was below half a million. Now, the ex-monk (seriously) appears to have had his prayers answered, tripling and doubling up and currently at about 2 million in chips. Black plays his poker mostly in Dublin and London and now plans to play much bigger events in the UK thanks to his bankroll guaranteed to be at least a quarter of a million. Like a typical Dubliner, Black has been fun spirited the whole way through, but when he drops his shades (upside down, Luske style) he drops the blarney and is all business. 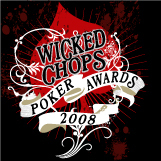 With two-thirds of Wicked Chops Poker team being Irish, we're quietly rooting for the Dubliner Black to at least earn a seat at the final table on Friday, but it will take more than the luck of the Irish and a few prayers to win it all with Ivey, Matusow and Raymer among those still in the game. By the way, speaking of Guinness (well sort of), call up the world record folks because Russell the Muscle is still getting a massage and an happy ending, NYC style, looks now to be a sure thing. I am really interested in being able to email Andy Black. I made the mistake of not talking to him more when I saw him at The Gold Strike in Tunica Ms. I was hoping someone who knew Andy could either give me his email address or give mine to him. I'm a 35 year old father and husband who likes to play poker. I'm interested in Andy's thought process and outlook on life.